As you are furnishing a dining room, you may be wondering whether you should opt for traditional wooden dining table, or go for a modern tempered glass unit. If you’ve never owned a glass dining table before, the important aspect worth considering before you reach for the wallet would be the perks and drawbacks of a glass dining table. To help you make your choice more clear, we will focus on glass dining table pros and cons. This may surprise you, but glass dining tables are actually not as fragile as they look. Most of such units are made of tempered glass, which underwent special processing and is extremely hard to break. This is good news – after all, it ensures the table’s long service period. The most attractive feature of a glass dining table is its transparency, which makes it simply irreplaceable, if you are looking for optimal furniture arrangment for a small dining room. Transparent table makes the room seem visually larger and helps ‘lighten’ it up, which is the obvious benefit. 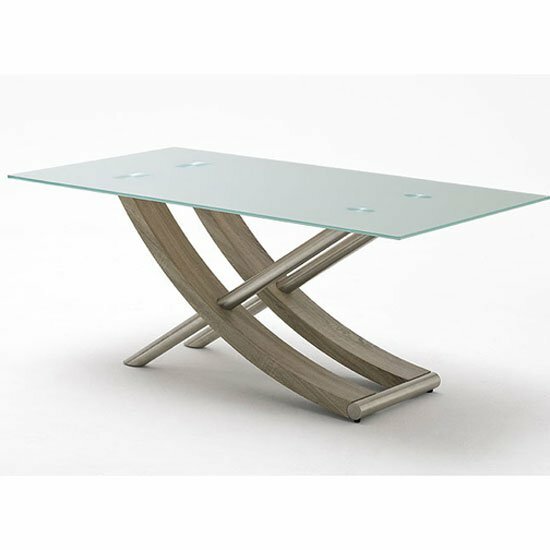 A typical glass dining table would feature transparant glass surface on wooden, chrome or wrought iron legs or base. However, there are lots of other options: the glass surface may be frosted and tinted into any colour, also, glass tables are available in almost any shape you can think of. Corner and extending arrangements are also available in most funriture stores. Surprisingly, the transparency of a glass unit may also be regarded as one of its downsides: you can actually see everything that’s underneath is, so your flooring surface should be impeccable. Before you go for a glass dining table, make sure your dining room won’t require major redecoration to make the end picture look good. Speaking of glass dining table pros and cons, we simply can’t help but mention cleaning and maintanance. The good news is – tempered glass surfaces are scratch proof. The bad news – cleaning them will require some effort. You will have to use detergents and wipe the unit dry to avoid the streaks. Unless its oval or round and its edges are protected with rubber lining, glass dining tables are not 100% safe (important aspect to consider, especially if you have small children). You can get injured by accidentally bumping into sharp corners, so choosing a table with protected edges will be a wise decision. Some owners of glass dining tables complain that, due to the properties of production material, such units feel ‘cold’, especially in winter. Others are annoyed by the loud soud that plates and cutlery make when placed on glass surface, so if you are sensitive to such things, consider going for traditional wooden unit. All in all, we have outlined the main glass dining table pros and cons to help you arrive at your final decision; in any case, you can always find a wide range of alternative solution in big UK stores .